Anthropology doctoral student Brittany Walter got involved with the Graduate Student Association when she first arrived on campus. Now as president, she hopes more graduate students join in. Balancing family, work and studies is a challenge most graduate students face, but the Graduate Student Association wants to add one more thing — getting involved on campus. Walter got involved with the association her first semester on campus, participating with committees and doing universitywide service. It’s good experience for the doctoral student who hopes to be on the tenure-track when she finishes her degree. Serving as president has helped her with public speaking and helped her establish relationships across the university. Since getting involved, Walter has seen the association expand its involvement on campus, working closely with The Graduate School and developing its relationship with Student Government. She says she hopes to see that role continue to grow on campus and for more of campus to recognize graduate students. In addition to advocating for graduate students, the group plans events throughout the year, including happy hours and social gatherings, and professional development programming. Walter says these events are the perfect time for graduate students to interact outside their disciplines and network across departments. That can lead to collaborations on research and work. This week, the Graduate Student Association is hosting a week of events to promote graduate students on campus. The week will culminate with the annual Graduate Student Day on Friday, April 10, an annual celebration, competition and award ceremony. Graduate Student Day is the university’s most comprehensive showcase of graduate scholarly and creative work. Sponsored by The Graduate School and held each spring, the event provides students an opportunity to present their work to the university and the larger community. 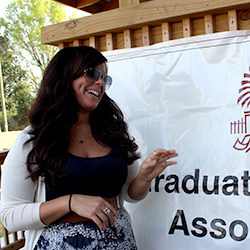 All graduate students are automatically in the Graduate Student Association, but to find out more about how to get involved or about upcoming events follow the group on social media and check them out online.